We wanted to create a first class window cleaning company offering the best service in and around the Cranleigh/Guildford area, but what exactly was the best way to do this? We had our own thoughts on the matter, but to check we asked everyone we knew, what they would like from their ideal window cleaner. Our service, detailed below, summarises these findings. Reliability – to know in advance when the windows will be washed and to be able to trust that it will happen on that day. Cleaning of windows – really sparkling windows, including the glass, frames and the sills, and for the windows to remain gleaming after rainfall. Competitive pricing – a choice of service options to allow the customer to pick the price most appropriate to their budget. Guaranteed workmanship – with a free re wash to any window if not fully satisfied. Security – easily identifiable window washing operatives, fully accountable for their work. Knowing staff are on site – before the job starts (no sudden ‘heads at the window’) and when they are leaving. Easy to talk to – in the event of a special requirement or a problem. Health and Safety– working in accordance with the latest Working at Height regulations to reduce accidents whilst on clients’ premises. Full insurance – should something go wrong. Payment options – a range of payment options other than just cash on the day, including online payments and autopay, to ensure you never miss a payment. Not just your average window cleaners! 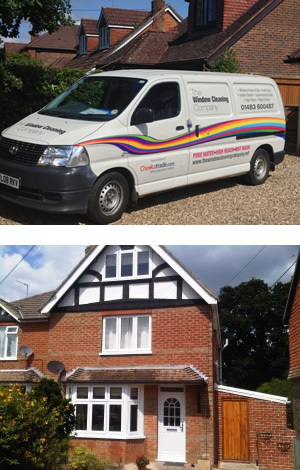 We offer a choice of affordable options for standard cleaning services: Regular external window cleaning on a 4, 6 or 8 weekly round to suit your needs. End of tenancy cleans, builders cleans, one off cleans. Conservatories, conservatory roofs, lantern lights. Roof windows, veluxs’ and dormers. Soffits, fascias and gutter faces. Please contact us on 01483 600487 or send an email if you have any special requirements. We supply a complete window cleaning service to your home or commercial property, by uniformed staff that we hope you’ll feel comfortable with. In most areas, we can offer a choice of cleaning services to match both your need and your budget. The external wash consists of a gentle scrub to the glass, frames and sills, followed by a thorough rinse. We use purified water throughout the wash to ensure that the glass sparkles and the frames and sills gleam. This process is suitable for all types of window, including UPVC, steel, leaded lights, wood, Georgian bar and aluminium, but does not include any sills made from tile, brick or concrete. External surfaces are left to dry naturally following the final rinse to prevent smearing. Internal cleaning is applied to the glazing only with traditional mops and squeegees, using an anti-static detergent and microfiber cloths. As inside windows are unaffected by the weather, the gap between cleans is usually considerably greater than for the outside wash. So if you live in or around the Guildford area and could use our great first class services in window cleaning, gutter & patio cleaning.